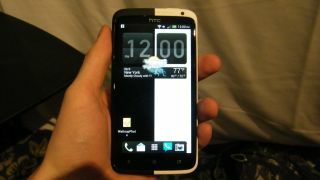 The well known HTC One X has been given a celebrity makeover for New York Fashion Week. The black and white design comes courtesy of Cushnie Et Ochs, and although it does invoke flashbacks of Cruella De Vil, this limited edition handset shouldn't give small children nightmares, nor were any dogs harmed in the making of this smartphone. The two-tone black and white body wraps round the whole of the polycarbonate body on the One X and the theme is continued on screen with a dedicated wallpaper and darker clock widget. You'll also find a couple of added extras in terms of additional pre-installed applications on the handset, although the rest of the specifications match the American version of the One X, including a 1.5GHz dual-core processor, 4G LTE and Android Ice Cream Sandwich with the Sense 4.0 overlay. If you fancy getting your hands on the HTC One by Cushnie Et Ochs then you're out of luck as it won't be coming to market. Only a handful have been made, but here are a range of snaps for you to ogle instead.